After use in harsh environments the LIFT FAN SHAFTING from the Landing Craft, Air Cushion (LCAC) can exhibit significant damage to the seal contact areas and bearing journals. Additionally, the threaded shaft surfaces can be damaged due to cross threading/thread galling. Due to these phenomena, A&A Co. has worked closely with the U.S. Navy to rebuild these damaged areas by applying a HVOF Tungsten Caribide/Nickel Superalloy material for restoration of the seal and bearing areas, and a weld to repair the damaged threads. Not only is this an effective repair as an alternative to replacement, but the coating adds extreme wear resistant properties which lead to improved service life in the field. 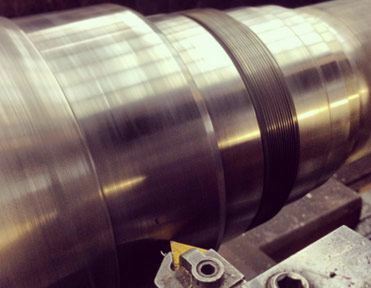 A&A Company’s material is a Tungsten Carbide/Nickel base Superalloy. When applied through the HVOF process, this material produces dense, well bonded coatings with a high level of wear resistance. Coatings of this Superalloy resist wear by abrasive grains, hard surfaces and fretting. Field tests have shown coatings to possess fatigue properties equal to or better than chrome plating. Additionally, this material has been qualified to be used under the MIL-STD-1687-A specification as an alternative to chrome plating. 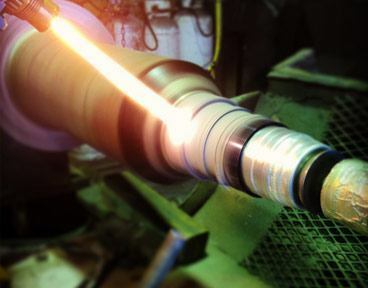 These coatings also have excellent submerged salt water corrosion resistance and have completed successful field testing on a large hydraulic steering rod. Salt fog tests (ASTM B117) show the material to have corrosion resistance several times greater than chrome plating.